Karimi, G., Hassanzadeh, M., Teimuri, M., Nazari, F., Nili, A. (2007). Aflatoxin M1 Contamination in Pasteurized Milk in Mashhad, Iran. Iranian Journal of Pharmaceutical Sciences, 3(3), 153-156. Gholamreza Karimi; Mohammad Hassanzadeh; Marziye Teimuri; Firuzeh Nazari; Amir Nili. "Aflatoxin M1 Contamination in Pasteurized Milk in Mashhad, Iran". 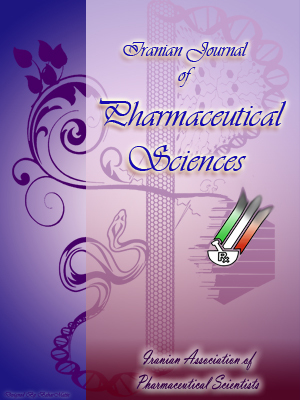 Iranian Journal of Pharmaceutical Sciences, 3, 3, 2007, 153-156. Karimi, G., Hassanzadeh, M., Teimuri, M., Nazari, F., Nili, A. (2007). 'Aflatoxin M1 Contamination in Pasteurized Milk in Mashhad, Iran', Iranian Journal of Pharmaceutical Sciences, 3(3), pp. 153-156. Karimi, G., Hassanzadeh, M., Teimuri, M., Nazari, F., Nili, A. Aflatoxin M1 Contamination in Pasteurized Milk in Mashhad, Iran. Iranian Journal of Pharmaceutical Sciences, 2007; 3(3): 153-156. The aim of this study was to evaluate aflatoxin M1 (AFM1) contamination in pasteurized milk samples in Mashhad, Iran. One hundred and ten milk samples from different supermarkets were collected during three months in spring and investigated by Enzyme Linked Immuno Sorbent Assay (ELISA). AFM1 was found in 100% of the milk samples. About 5.4% of the samples contained AFM1 greater than the maximum tolerance limit (0.05 μg/l) accepted by European Union. There was not a significant difference among the mean value of AFM1 in three months. Milk is a good source of many nutrients, and it is used extensively even as a main food in many countries. However, milk could also be a source of toxic substances such as aflatoxin M1 (AFM1). Aflatoxins are a group of naturally occurring toxins produced by moulds such as Aspergillus flavus. When some animals ingest aflatoxin B1 (AFB1)-contaminated feed, it is metabolized to AFM1 and transferred to food materials such as milk and eggs [1, 2]. AFM1 remain stable when milk is heat-treated; there is no evidence that cold storage, concentrating or drying changes the level of AFM1 [3, 4]. Although the potency of AFM1 is less than that of its parent compound, it is also known to be hepatotoxic and carcinogenic [5, 6]. More recently, aflatoxin exposure early in life has been associated with impaired growth, particularly stunting . Therefore, the presence of AFM1 in milk and dairy products may pose a threat, mainly towards children who are considered to be the major consumer of milk and dairy products in many countries . This study was carried out to evaluate the prevalence of pasteurized milk contamination with AFM1 in Mashhad, Iran and to compare the results with maximum tolerance limit (0.05 μg/l) accepted by some European countries . For measurement of AFM1, we used ELISA because immunochemical assays are reliable, rapid, simple, specific and sensitive methods for the routine analysis of mycotoxins in food and feed materials [10, 11]. Table 1. Concentration of aflatoxin M1 in milk samples collected in different months. *Samples were collected in 2006. One hundred and ten pasteurized milk samples from different supermarkets in Mashhad were collected during spring (March, April, May, 2006). The method is based on the modification of Alborzi et al. . Milk samples were centrifuged in 20 °C for 10 min. with 3500 g. After discarding the upper cream layer, the lower phases were used for quantitative test. The AFM1 quantity was determined by Ridascreen AFM1 test (R-biopharm, Germany) which is a competitive enzyme immunoassay based on antigen-antibody reaction. Sample solutions of 100 μl were added to wells that coated antibodies to AFM1 and after mixing, incubated for 60 min. at the room temperature in dark. Then the liquid was poured out of the wells and wells were washed with buffer solution. In the next state, 100 μl of enzyme conjugate washed with buffer and 50 μl of the enzyme substrate and 50 μl of chromogen were added to wells and incubated for 30 min. at the room temperature in the dark. Bond enzyme conjugate converted the chromogen to a blue product and then 100 μ1 of the stop solution was added to wells which lead to a yellow discoloration of the chromogen. The AFM1 measurement was performed photometrically at 450 nm. The results are expressed as meanESD. Data were analyzed by ANOVA. Sequential differences among means were calculated at the level of p < 0.05, using Tukey contrast analysis or Dunn's test as needed. The results of our study are shown in Table 1. AFM1 in March, April and May samples ranged from 0.008 to 0.034, 0.009 to 0.039 and 0.013 to 0.089 μg/l, respectively. There are differences in maximum permissible limit of AFM1 in various countries, and many including Iran have no legal limit for AFM1 in milk. AFM1 was found in 100% of milk samples. About 5.4% of the samples had AFM1 greater than maximum tolerance limit (0.05 μg/l) accepted by European Union. There was not a significant difference among the mean value of AFM1 in the three months. There is little documented data about the occurrence of milk AFM1 in Iran (Table 2). In Tehran, from 73 samples were analyzed. AFM1 detected in 60 samples . All contaminated samples had a level of AFM1 above the European limit. In Sarab, a city in north west of Iran, from 111 samples, AFM1 was observed in 85 samples. In 40% of positive samples, AFM1 levels were higher than the European limit . In Shiraz, 624 samples analyzed. 100% of the samples were contaminated and 17.8% of samples had AFM1 greater than the European limit . Another study in Tehran showed that from 128 samples, 78% was higher than the European limit . The changes in milk contamination in Iran may be due to differences in the time of sampling, method of determination and level of cowsheds sanitation in cities. Table 2. The prevalence of milk contamination in cities of Iran. Our results showed that contamination with AFM1 in our region is lower than other regions reported in Iran, most probably because of low contaminated food collections used by cows, industrialization of cowsheds, training the personnel and the season of our sampling (spring). Some studies indicated seasonal effect influences AFM1 occurrence and a higher incidence of AFM1 contamination during cold seasons than hot ones [16, 17]. Therefore, the results obtained by us were in agreement to prior studies. According to results obtained in Iran, the incidence and contamination levels of AFM1 in some cities of Iran seem to be a serious problem for public health, especially infants and children. So, to produce high quality milk, it is essential to keep feeds free from contamination to AFB1. The concentration of AFB1 in animal feed can be reduced by good manufacturing and good storage practices. If preventive measures fail, however, AFB1 can be reduced in food by blending with feed that has lower concentrations or by chemical, physical or biological treatment . Also, increasing the intake of antioxidants and vitamins with the diet in order to prevent carcinogenesis should be involved in the preventive strategies . Polan CE, Hayes JR, Campbell TC. Consumption and fate of aflatoxin B1 by lactating cows. Agr Food Chem 1974; 22: 635-8. Frobish RA, Bradley BD, Wagner, DD, Long-Bradley PE, Hairston H. Aflatoxin residues in milk of dairy cows after ingestion of naturally contaminated grain. J Food Protec 1986; 49: 781-5. Rustom IYS. Aflatoxin in food and feed: Occurrence, legislation and inactivation by physical methods. Food Chem 1997; 59: 57-67. Park DL. Effect of processing on aflatoxin. Adv Exp Med Bio 2002; 504: 173-9. Bullerman LB. Significance of mycotoxins to food safety and human health. J Food Protect 1979; 42: 65-86. Chu FS . Mycotoxins: Food contamination, mechanism, carcinogenic potential and preventive measures. Mutation Res 1991; 259: 291-306. Gong YY, Cardwell K, Hounsa A, Egal, S, Turner PC, Hall A. Dietary aflatoxin exposure and impaired growth in young children from Benin and Togo: Cross sectional study. Brit Med J 2002; 325: 20-1. Williams JH, Philips DT, Jolly PE, Stiles JK, Jolly, CM, Aggaewul D. Human aflatoxicosis in developing countries: A review of toxicology, exposure, potential health consequences and intervention. Am J Clin Nutr 2004; 80: 1106-22. Anonymous. European community comments for the codex committee on food additives and contaminants. 2000; CL 1999/13-GEN-CX 0016 FAC-Agenda item 16a. Magliulo M, Mirasoli M, Simoni P, Lelli R, Portanti O, Roda A. Development and validation of an ultrasensitive chemiluminescent enzyme immunoassay for AFM1 in milk. J Agr Food Chem 2005; 53: 3300-5. Rosi P, Borsari A, Lasi G, Lodi S, Galanti A, Fava A, Girotti S, Ferri E. Aflatoxin M1 in milk: Reliability of the immunoenzymatic assay. Int Dairy J 2007; 17: 429-35. Alborzi A, Pourabbas B, Rashi M, Astanch B. Aflatoxin M1 contamination in pasteurized milk in Shiraz (south of Iran). Food Control 2006; 17: 582-4. Karimi G. Study on the contamination of milk with aflatoxin in Tehran area using ELISA method. J Pajoohesh Sazandeh 1998; 40: 163-5. Kamkar A. A study on the occurrence of aflatoxin M1 in raw milk produced in Sarab city of Iran. Food Control 2005; 16: 593-9. Oveisi MR, Jannat B, Sadeghi N, Hajimahmoodi M, Nikzad A. Presence of aflatoxin M1 in milk and infant milk product in Tehran. Iran. Food Control 2007; (In press). Bachner U, Martlbauer E, Terblan G. Detecting aflatoxin M1 in milk from selected parts of Bevaria by assign ELISA. German Federal Republic. On Dairy Science Abstract 1990; 52, 901. Blanco JL, Dominguez L, Gomez-Lacia E, Garayzabal JFF, Garcia JA, Suarez G. Presence of aflatoxin M1 in commercial ultra high temperature treated milk. Appl Environ Microbiol 1998; 56: 1622-3. Piva G, Galvano F, Pietri A. Detoxification method of aflatoxins: A review. Nutr Res 1995; 15: 767-76. Karihtala P, Soini Y. Reactive oxygen species and antioxidant mechanisms in human tissues and their relation to malignancies. Acta Pathol Microbiol Immunol 2007; 115: 81-103.